Pecas's Story . . .
Pecas came to MAESSR when his New Jersey owner‘s long hours and wife’s health issues prevented them from giving this guy exercise. 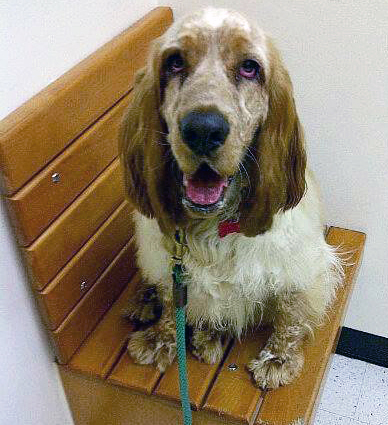 Not having enough time for activity and a dog who strained at the leash weren't a good combination for the couple so this beautiful lemon colored Springer, born in South America, came to MAESSR to find a new home. 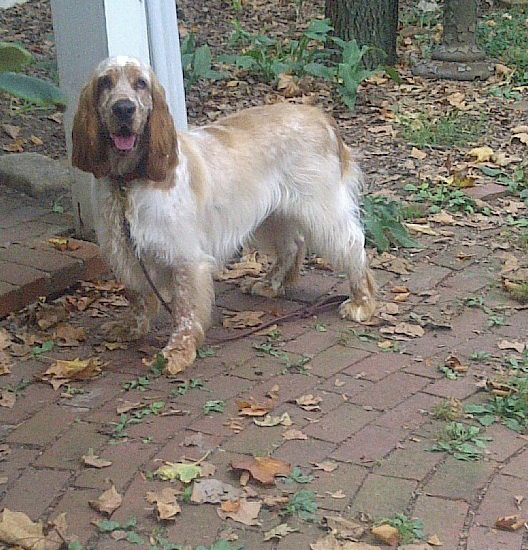 He showed up at his foster home and immediately started playing second fiddle to the resident Springer and two hounds. Pecas plays chase and keep-away with the younger hound, ignores the older grumpy Springer and goes into "you're the person I've known longest in my new existence" routine with his foster mom. While he initially barked when the foster dad came home, he soon learned that this tall person was part of the family and now just barks when too many birds are on the bird feeder or in tandem when the younger hound spots squirrels. The first day or two, Pecas preferred to pee/poop on leash but soon learned that the fenced in yard was fine for doing one's business. His foster folks aren't sure of his sign to go out but since he seems to hold it for more than five hours and mimic the residents, housetraining hasn't been an issue. He sleeps on the floor at the base of the stairs to the bedroom at night, hanging out near the residents, and had no issues at all settling in immediately his first night—home is where the people love you and the dogs are friendly!! This handsome guy doesn't counter-surf or seem to consider the trash can a potential source of food. Though he chows down, one can easily pick up his dish, and he doesn't challenge the residents who eat more slowly. He will clean up their dishes if they walk away for some reason, so he's usually gated clear of the slower diners. He doesn't get on furniture but will lie upside down under the futon hoping for pets. Pecas, whose name is Spanish for Freckles, knows “sit,” “down,” and “wait.” He's great in the car but seems overwhelmed if taken to noisy sporting events where everyone wants to pet him because he's so cute. He shies away and grumbles at other dogs in crowd situations so he would probably prefer a mellow home life where he can meet people one on one and learn to trust them. On leash, he pulls a bit but settles down unless in tandem with his foster sister where they seem to feed off one another to see who can spot the most critters. He means well and a Gentle Leader helps. Storms don't seem to bother him, and, though he whimpers a bit when his foster folks leave, he soon settles down to wait for them to return. He knows “crate up” but since he doesn't get into trouble is generally left uncrated when alone or at night. He loves his rubber pig for carrying around and any of the assorted soft toys for fetch and keep away. Though mellow during the day, one of his favorite expressions is, “Who wants to go outside?” He loves being brushed or touched anywhere. 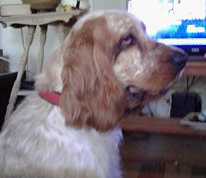 His behavior at the groomers is unknown, but assumed to be good as he arrived in pristine condition. 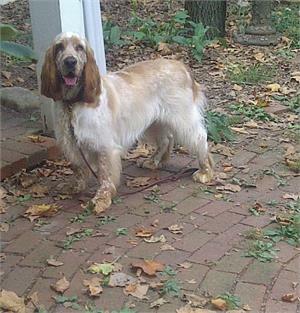 Pecas is fine with or without other dogs; he enjoys other dogs and does not mind having to share his humans with them. He isn't needy with his people, but definitely loves having attention paid to him. He’s mild mannered and handsome, but shy when initially meeting new folks. The South American cutie is an easy dog to have around, a good hiking buddy, and a pleasure to transport. When his foster mom recently checked before bed to see where he was, she had to inspect several piles of sleeping dogs before spotting him on a nearby dog bed. "Who's a good boy?" got no reaction from any of the pack. That's how his family knows that the new guy is town is settling in. Pecas will soon be ready for his forever home. Would you like him to settle in with you, run through the fall leaves at your house and watch for the Great Pumpkin with your family? Look for updates on this handsome fellow.